The weather was sunny and in the 40s for Thursday's home opener as a chilly wind slept through Citizens Bank Park. It is often a reality that many people cannot see the forest for the trees, and that is the case of baseball fans, players, management and owners who lament about three hour ballgames. Many of the aforementioned are more or less obsessed with speeding up the game. Well, at least from this side of the page, the real problem isn’t the length of the games – it’s the length of the season. It is simply ridiculous to think that the time of an average baseball game is too hard to endure at about three hours. In fact, Major League Baseball Commissioner Rob Manfred was encouraged a few weeks ago when it was established that on average the games early this season were played in 2:59:49, a decrease of about five minutes from last season. Mind you, this is after introducing rules that limited the number of visits to the mound by a manager or coach, and generally trying to speed up the time it takes to actually throw a pitch. Nobody is going to decide to watch a whole game because it saves five minutes of time. In fact, if you actually go to the ballpark – which is a much bigger issue in terms of attendance, a five-minute saving of time is absurd. For years, many people simply leave early to avoid traffic, and in Los Angeles the fans simply come later to the games, and will continue to do just that even if the game took under two hours. Instead of the absurd tinkering adjustments, it’s more than time that Major League Baseball really attacked the problem of fewer people watching its product by admitting there is simply TOO MUCH of the product. If other sports learned nothing from the NFL it is that less is more. The NFL plays a single game a week, and manages to stretch out its season from September to February with no lack of interest. There is no reason that Major League Baseball could not cut into its season to attract more fans, or at least keep its fans more involved. Playing a 162-game season is absurd – especially in an era in which playoffs have expanded to make the post season another month on the sport’s calendar. Major League Baseball would be far better off if it collapsed its schedule by at least 20 games – if not more, and might then even consider adding a level of playoffs. What is so darn holy about a 162-game season? Statistics? That is pure nonsense, and the fake gospel that Major League Baseball can’t tamper with its length of the season is preposterous when you consider how its record books were ravaged by the PED era. You can also just take a look at any statistical compilation of this baseball season. Do those columns look like “hallowed” statistics to anybody? There is as much emphasis on launch angles and exit velocity as home runs and RBI. We are dealing with a whole new world of statistics and analytics, so stop with the old gripe that a shorter season would damage the game’s hallowed numbers. This is a whole new ballgame, and Major League Baseball might as well face up to the fact that big changes are needed to revive the sport as a national entity and not just a local attraction. It will be the natural adjustment of offense to defeat defense. It takes place in all sports, and it will also happen in baseball without any tinkering from the lords of the game. Baseball needs some broad stroke changes that should begin with adding the Designated Hitter to the National League – a simple fix, and also it needs to stop highlighting the horror of the pace of its games. Get a good team on the field, and nobody will complain about the length or pace of the game. It seems like the national TV networks can’t get enough of the Red Sox vs. Yankees games – and they take about four hours every time they play. You really want to make people want to have more interest in watching the games – stop making it as common as elevator music. The bigger markets would surely complain about cutting games for the simple reason that more games means more income, but his would be done for the benefit of the entire sports – not just the Yankees, Red Sox, Cardinals, Dodgers and the Phillies in a good year. Take a look at the Phillies this season. 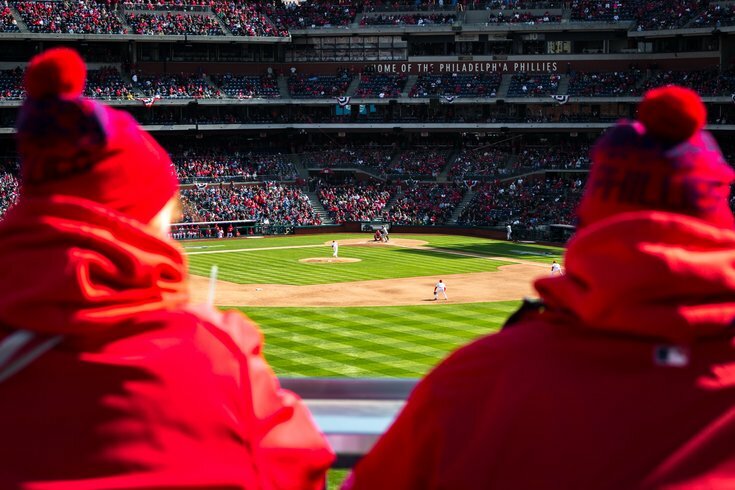 They are now well past the golden era at Citizens Bank Park when Chase Utley, Jimmy Rollins and Ryan Howard ensured the place would be packed each and every night. This version of the Phillies is a young team that has exceeded expectations, and yet they struggle to get 25,000 people in the ballpark. Unless the team is a “hot ticket” from success in the previous season, it is nearly impossible to fill a ballpark in April and early May while kids are in school and the weather in many part of the country is so sketchy. Although fans are more than willing to deal with some chill if the team in involved in playoffs in mid to late October, nobody wants to freeze through a game in April or early May. It would be so simple to slice the schedule in April with a later start, and then have a least one day off a week in May. And then maybe an added round of playoffs. Well, these ideas have probably set off the so-called traditionalists. Then again, some of those people still think you could hold a gem in a cornfield and draw a crowd. Guess what, that was a movie, corn doesn’t talk, and we need less baseball to make it more important.